Area: 56,785 sq. km. ; slightly smaller than West Virginia. Cities: Capital — Lome 1,593,000 (pop. 2009 est.). Other major cities — Sokode 111,200; Kara 104,900; Atakpame 77,300; Dapaong 53,600. Terrain: Savannah divided from a coastal plain by a range of low hills. Nationality: Noun and adjective (sing. and pl.) — Togolese. Annual population growth rate (2011 estimate): 2.762%. Ethnic groups: Ewe, Mina, Kabye, Cotocoli, Moba, and others. Religions (est. ): Indigenous beliefs 51% Christian 29%, Muslim 20%. Languages: French (official), local (Ewe, Mina, Kabye). Education: Attendance (2006): 74.6% of age group 6-11 enrolled. Literacy (2006) — male 70%, female 44%. Health: Life expectancy (2011): male 60 years, female 65 years. Work force: (1999 est.) Total: 2 million (43% of the total population); rural work force (est.) — 1,350,000; urban work force (est.) — 650,000. Independence: April 27, 1960 (from French-administered UN trusteeship). Branches: Executive: president (chief of state); prime minister (head of government). Legislative — National Assembly. Judicial — Supreme Court. Political parties: Rassemblement du Peuple Togolais (RPT); Union des Forces de Changement (UFC); Comite d'action pour le Renouveau (CAR), Pan-African Patriotic Convergence Party (CPP), Democratic Convention of the African People (CDPA); National Alliance for Change (ANC). National holiday: Independence Day, April 27. Per capita income (2010): $900. Natural resources: Phosphates, limestone, marble. Agriculture (47% of 2009 GDP): Products — yams, cassava, corn, millet, sorghum, cocoa, coffee, rice, cotton. Industry (25% of 2008 GDP): Types: mining, manufacturing, construction, energy. Services: 27% of 2009 GDP. Trade: (2010): Exports: $859 million: phosphates, cocoa, coffee, cotton. Imports — $1.54 billion: consumer goods, including foodstuffs, fabrics, clothes, vehicles, equipment. Major partners — Ghana, France, Burkina Faso, Germany, Mali, Netherlands, India, Belgium, Benin. 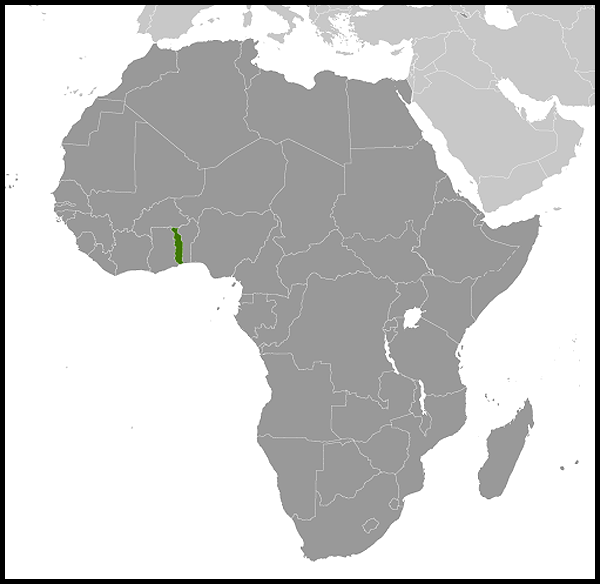 Togo is bounded by Ghana, Burkina Faso, Benin, and the Gulf of Guinea. It stretches 579 kilometers (360 mi.) north from the gulf and is only 160 kilometers (100 mi.) wide at the broadest point. The country consists primarily of two savanna plains regions separated by a southwest-northeast range of hills (the Chaine du Togo). Togo's climate varies from tropical to savanna. The south is humid, with temperatures ranging from 23oC to 32oC (75oF to 90oF). In the north, temperature fluctuations are greater — from 18oC to more than 38oC (65oF to 100oF). Togo's population of over 6 million people (2011 est.) is composed of more than 20 ethnic groups. The two major groups are the Ewe in the South and the Kabye in the North. Population distribution is very uneven due to soil and terrain variations. The population is generally concentrated in the south and along the major north-south highway connecting the coast to the Sahel. The ethnic groups of the coastal region, particularly the Ewes (about 21% of the population), constitute the bulk of the civil servants, professionals, and merchants, due in part to the former colonial administrations which provided greater infrastructure development in the south. The Kabye (16% of the population) live on marginal land and traditionally have emigrated south from their home area in the Kara region to seek employment. Their historical means of social advancement has been through the military and law enforcement forces, and they continue to dominate these services. Most of the southern peoples use the Ewe or Mina languages, which are closely related and spoken in commercial sectors throughout Togo. 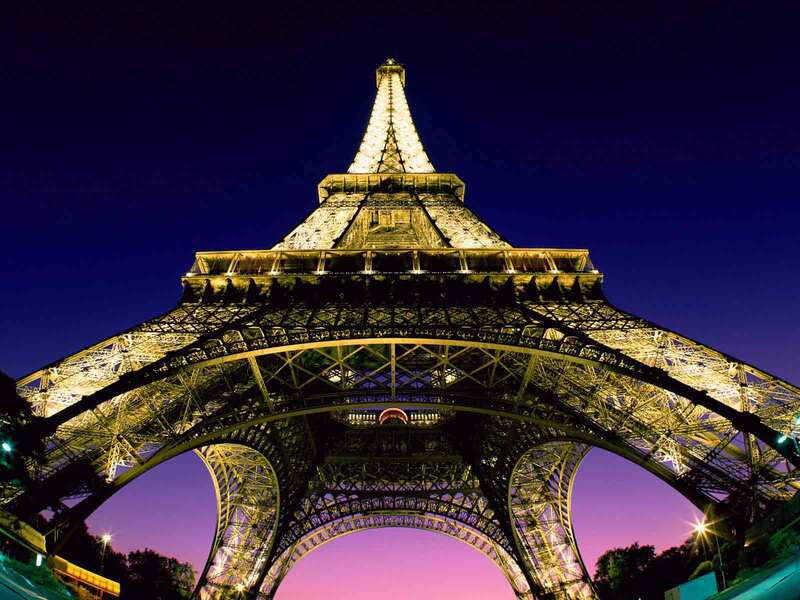 French, the official language, is used in administration and documentation. The public primary schools combine French with Ewe or Kabye as languages of instruction, depending on the region. English is spoken in neighboring Ghana and is taught in Togolese secondary schools. As a result, many Togolese, especially in the south and along the Ghana border, speak some English. The Ewes moved into the area which is now Togo from the Niger River valley between the 12th and 14th centuries. During the 15th and 16th centuries, Portuguese explorers and traders visited the coast. For the next 200 years, the coastal region was a major raiding center for Europeans in search of slaves, earning Togo and the surrounding region the name "The Slave Coast." In an 1884 treaty signed at Togoville, Germany declared a protectorate over a stretch of territory along the coast and gradually extended its control inland. Because it became Germany's only self-supporting colony, Togoland was known as its model possession. In 1914, Togoland was invaded by French and British forces and fell after brief resistance. Following the war, Togoland became a League of Nations mandate divided for administrative purposes between France and the United Kingdom. After World War II, the mandate became a UN trust territory administered by the United Kingdom and France. During the mandate and trusteeship periods, western Togo was administered as part of the British Gold Coast. In 1957, the residents of British Togoland voted to join the Gold Coast as part of the new independent nation of Ghana. By statute in 1955, French Togo became an autonomous republic within the French union, although it retained its UN trusteeship status. A legislative assembly elected by universal adult suffrage had considerable power over internal affairs, with an elected executive body headed by a prime minister responsible to the legislature. These changes were embodied in a constitution approved in a 1956 referendum. On September 10, 1956, Nicholas Grunitzky became prime minister of the Republic of Togo. However, due to irregularities in the plebiscite, an unsupervised general election was held in 1958 and won by Sylvanus Olympio. On April 27, 1960, in a smooth transition, Togo severed its constitutional ties with France, shed its UN trusteeship status, and became fully independent under a provisional constitution with Olympio as president. A new constitution in 1961 established an executive president, elected for 7 years by universal suffrage, and a weak National Assembly. The president was empowered to appoint ministers and dissolve the assembly, holding a monopoly of executive power. In elections that year, from which Grunitzky's party was disqualified, Olympio's party won 90% of the vote and all 51 National Assembly seats, and he became Togo's first elected president. During this period, four principal political parties existed in Togo: the leftist Juvento (Togolese Youth Movement); the Union Democratique des Populations Togolaises (UDPT); the Parti Togolais Du Progres (PTP), founded by Grunitzky but having limited support; and the Comite Unite Togolaise (CUT), the party of President Olympio. Rivalries between elements of these parties had begun as early as the 1940s, and they came to a head with Olympio dissolving the opposition parties in January 1962, ostensibly because of plots against the majority party government. Many opposition members, including Grunitzky, fled to avoid arrest. On January 13, 1963, President Olympio was assassinated in an uprising of army non-commissioned officers dissatisfied with conditions following their discharge from the French army. Grunitzky returned from exile 2 days later to head a provisional government with the title of prime minister. On May 5, 1963, the Togolese adopted a new constitution which reinstated a multi-party system, chose deputies from all political parties for the National Assembly, and elected Grunitzky as president and Antoine Meatchi as vice president. Nine days later, President Grunitzky formed a government in which all parties were represented. During the next several years, the Grunitzky government's power became insecure. On November 21, 1966, an attempt to overthrow Grunitzky, inspired principally by civilian political opponents in the CUT party, was unsuccessful. Grunitzky then tried to lessen his reliance on the army, but on January 13, 1967, Lt. Col. Etienne Eyadema (later Gen. Gnassingbe Eyadema) ousted President Grunitzky in a bloodless military coup. Political parties were banned, and all constitutional processes were suspended. The committee of national reconciliation ruled the country until April 14, when Eyadema assumed the presidency. In late 1969, a single national political party, the Rally of the Togolese People (RPT), was created, and President Eyadema was elected party president on November 29, 1969. In 1972, a national referendum, in which Eyadema ran unopposed, confirmed his role as the country's president. In late 1979, Eyadema declared a third republic and a transition to greater civilian rule with a mixed civilian and military cabinet. He garnered 99.97% of the vote in uncontested presidential elections held in late 1979 and early 1980. A new constitution also provided for a national assembly to serve primarily as a consultative body. On September 23, 1986, a group of some 70 armed Togolese dissidents crossed into Lome from Ghana in an unsuccessful attempt to overthrow the Eyadema government. However, this failed and in December Eyadema was reelected to a third consecutive 7-year term with 99.5% of the vote in an uncontested election. In 1989 and 1990, Togo, like many other countries, was affected by the winds of democratic change sweeping eastern Europe and the Soviet Union. On October 5, 1990, the trial of students for distributing antigovernment tracts sparked riots in Lome. Antigovernment demonstrations and violent clashes with the security forces marked the months that followed. In April 1991, the government began negotiations with newly formed opposition groups and agreed to a general amnesty that permitted exiled political opponents to return to Togo. After a general strike and further demonstrations, on June 12, 1991, the government and opposition signed an agreement to hold a "national forum". The national forum, dominated by opponents of President Eyadema, opened in July 1991 and immediately declared itself to be a sovereign "National Conference." Although subjected to severe harassment from the government, the conference drafted an interim constitution calling for a 1-year transitional regime tasked with organizing free elections for a new government. The conference selected Joseph Kokou Koffigoh, a lawyer and human rights leader, as transitional prime minister but kept President Eyadema as chief of state for the transition, although with limited powers. A test of wills between the president and his opponents followed over the next 3 years during which President Eyadema gradually gained the upper hand. Frequent political paralysis and intermittent violence marked this period. Following a vote by the transitional legislature (High Council of the Republic) to dissolve the President's political party — the RPT — in November 1991, the army attacked the prime minister's office on December 3 and captured the prime minister. Koffigoh then formed a second transition government in January 1992 with substantial participation by ministers from the President's party. Opposition leader Gilchrist Olympio, son of the slain president Sylvanus Olympio, was ambushed and seriously wounded, apparently by soldiers, on May 5, 1992. In July and August 1992, a commission composed of presidential and opposition representatives negotiated a new political agreement. On September 27, the public overwhelmingly approved the text of a new, democratic constitution, formally initiating Togo's fourth republic. However, the democratic process was set back in October 1992, when elements of the army held the interim legislature hostage for 24 hours, effectively ending the interim legislature. In retaliation, on November 16, opposition political parties and labor unions declared a general strike intended to force President Eyadema to agree to satisfactory conditions for elections. The general strike largely shut down Lome for months and resulted in severe damage to the economy. In January 1993, President Eyadema declared the transition at an end and reappointed Koffigoh as prime minister under Eyadema's authority. This set off public demonstrations, and, on January 25, members of the security forces fired on peaceful demonstrators, killing at least 19. In the ensuing days, several security force members were waylaid and injured or killed by civilian oppositionists. On March 25, 1993, armed Togolese dissident commandos based in Ghana attacked Lome's main military camp and tried unsuccessfully to kill President Eyadema. They inflicted significant casualties, however, which set off lethal reprisals by the military against soldiers thought to be associated with the attackers. Under substantial domestic and foreign pressure and the burden of the ongoing general strike, the presidential faction entered negotiations with the opposition. Four rounds of talks led to the July 11, 1993 Ouagadougou agreement, which set forth conditions for upcoming presidential and legislative elections and ended the general strike as of August 3, 1993. The presidential elections were set for August 25, but hasty and inadequate technical preparations, concerns about fraud, and the lack of effective campaign organization by the opposition led the chief opposition candidates — former minister and Organization of African Unity (OAU) Secretary General Edem Kodjo and lawyer Yawovi Agboyibo — to drop out of the race before election day and to call for a boycott. President Eyadema won the elections by a 96.42% vote against token opposition. About 36% of the voters went to the polls; the others boycotted. Ghana-based armed dissidents launched a new commando attack on military sites in Lome in January 1994. President Eyadema was unhurt, and the attack and subsequent reaction by the Togolese armed forces, including an 8-hour rampage in Lome, resulted in hundreds of deaths, mostly civilian. This provoked more than 300,000 Togolese to flee Lome for Benin, Ghana, or the interior of Togo. Most had returned by early 1996. The government went ahead with legislative elections in February 1994. In generally free and fair polls as witnessed by international observers, the allied opposition parties UTD and Action Committee for Renewal (CAR) together won a narrow majority in the National Assembly. On April 22, President Eyadema named Edem Kodjo, the head of the smaller opposition party, the UTD, as prime minister instead of Yawovi Agboyibo, whose CAR party had far more seats. Kodjo's acceptance of the post of prime minister provoked the CAR to break the opposition alliance and refuse to join the Kodjo government. Kodjo was then forced to form a governing coalition with the RPT. Kodjo's government emphasized economic recovery, building democratic institutions and the rule of law and the return of Togolese refugees abroad. In early 1995, the government made slow progress toward its goals, aided by the CAR's August 1995 decision to end a 9-month boycott of the National Assembly. However, Kodjo was forced to reshuffle his government in late 1995, strengthening the representation by Eyadema's RPT party, and he resigned in August 1996. Eyadema reemerged with a sure grip on power, controlling most aspects of government. In the June 1998 presidential election, the government prevented citizens from effectively exercising the right to vote. The Interior Ministry declared Eyadema the winner with 52% of the vote in the 1998 election; however, serious irregularities in the government's conduct of the election strongly favored the incumbent and appear to have affected the outcome materially. Although the government did not obstruct the functioning of political opponents openly, the President used the strength of the military and his government allies to intimidate and harass citizens and opposition groups. The government and the state remained highly centralized: President Eyadema's national government appointed the officials and controlled the budgets of all subnational government entities, including prefectures and municipalities, and influenced the selection of traditional chiefs. The second multi-party legislative elections of Eyadema's 33-year rule were held on March 21, 1999. However, the opposition boycotted the election, in which the ruling party won 79 of the 81 seats in the National Assembly. The remaining two seats went to candidates from little-known independent parties. Procedural problems and significant fraud, particularly misrepresentation of voter turnout, marred the legislative elections. After the legislative election, the government announced that it would continue to pursue dialog with the opposition. In July 1999, the government and the opposition began discussions, and on July 29, 1999, all sides signed an accord called the "Lome Framework Agreement," which included a pledge by President Eyadema that he would respect the constitution and not seek another term as president after his current one expired in 2003. The accord also called for the negotiation of a legal status for opposition leaders, as well as for former heads of state (such as their immunity from prosecution for acts in office). In addition, the accord addressed the rights and duties of political parties and the media, the safe return of refugees, and the security of all citizens. The accord also contained a provision for compensating victims of political violence. The President agreed to dissolve the National Assembly in March and hold new legislative elections, which would be supervised by an Independent National Election Commission (CENI) and which would use the single-ballot method to protect against some of the abuses of past elections. However, the March 2000 date passed without presidential action, and new legislative elections were ultimately rescheduled for October 2001. Because of funding problems and disagreements between the government and opposition, the elections were again delayed, this time until 2002. In May 2002 the government scrapped the CENI and appointed seven magistrates to oversee preparations for legislative elections. Not surprisingly, the opposition announced it would boycott them. The elections were held in October and the government party won more than two-thirds of the seats in the National Assembly. In December 2002, Eyadema's government used this rubber-stamp parliament to amend Togo's constitution, allowing President Eyadema to run for an "unlimited" number of terms. A further amendment stated that candidates must reside in the country for at least 12 months before an election, a provision that barred the participation in the upcoming presidential election of popular Union des Forces du Changement (UFC) candidate, Gilchrist Olympio, who had been in exile since 1992. The presidential election was held June 1, 2003. President Eyadema was re-elected with 57% of the votes, amid allegations of widespread vote rigging. On April 14, 2004, the Government of Togo signed an agreement with the European Union (EU) that included 22 commitments the Government of Togo must honor as a precondition for resumption of EU aid. Two of the most important of these commitments were a constructive national dialogue between the Government of Togo and the traditional opposition parties and free and democratic legislative elections. By November 2004, Togo had made modest progress on some commitments, releasing 500 prisoners, removing prison sentences from most provisions of the Press Code, and initiating a dialogue with the core opposition parties. Consultations were ongoing with the European Union with regard to when and how to resume development cooperation. On February 5, 2005 President Gnassingbe Eyadema died. In an unconstitutional move, the military leadership swore in Faure Gnassingbe, the late President Eyadema's son, as president. Immediate condemnation by African leaders followed by sanctions of the Economic Community of West African States and the African Union combined with pressure from the international community led finally to a decision on February 25 for Faure Gnassingbe to step down. Protest efforts by the public included a large demonstration in Lome that was permitted to proceed peacefully. Prior to stepping down, Faure Gnassingbe was selected as leader of the ruling party and named as a candidate in the announced presidential elections to choose a successor to Eyadema. Abass Bonfoh, National Assembly Vice President, was selected to serve as Speaker of the National Assembly and therefore simultaneously became interim President. Real power apparently was retained by Faure Gnassingbe as he continued to use the offices of the President while the interim President operated from the National Assembly. Deeply flawed elections held in April 2005 were marred by violence and widespread accusations of vote tampering, causing tens of thousands of Togolese to flee to neighboring Benin and Ghana. Faure Gnassingbe was pronounced the winner and was pressed by the international community — including regional heads of state — to form a government of national unity, including key opposition figures. After Faure Gnassingbe failed to reach agreement with the opposition, he named as Prime Minister Edem Kodjo of the Panafrican Patriotic Convergence party (CPP), an original founder of the ruling RPT and former OAU Secretary-General and Togolese Prime Minister. Kodjo subsequently named a cabinet that kept security-related ministries in the hands of the RPT and did not include any representatives from the genuine opposition. In August 2006 President Faure Gnassingbe and members of the opposition signed the Global Political Agreement (GPA). The GPA provided for a transitional unity government whose primary purpose would be to prepare for benchmark legislative elections. CAR opposition party leader and human rights lawyer Yawovi Agboyibo was appointed Prime Minister of the transitional government in September 2006. Leopold Gnininvi, president of the Democratic Convention of the African People party (CDPA), was appointed Minister of State for Mines and Energy. The third opposition party, UFC, headed by Gilchrist Olympio, declined to join the government, but agreed to participate in the National Electoral Commission and the National Dialogue follow-up committee, chaired by Burkina Faso President Blaise Compaore. The legislative elections held on October 14, 2007, in which all opposition parties participated, were declared free and fair by international and national election observers. The RPT, with 50 seats, won a majority. The UFC took 27 seats, with the CAR receiving the remaining 4. RPT members were elected to all the internal leadership positions within the National Assembly. On December 3, 2007, President Faure Gnassingbe appointed as the new Prime Minister Komlan Mally, an RPT member and former Minister of Urban Development. The President named the rest of his cabinet on December 13, 2007 from the RPT and a number of lesser parties. The number of ministries was reduced substantially, from 35 to 22. The other two parties elected to the National Assembly, the UFC and CAR, were not represented in the cabinet. On September 5, 2008, Prime Minister Mally submitted his resignation to President Faure Gnassingbe, who named Gilbert Fossoun Houngbo, formerly of the United Nations Development Program, to the position 2 days later. The rest of the cabinet was named on September 16, 2008 and was composed of members of the RPT, the CDPA, the CPP, and civil society. The number of ministers rose from 22 to 26, plus two secretaries of state. On March 4, 2010 Togo held its presidential election, in which President Faure Gnassingbe was re-elected with over 60% of the vote. Organized by the Independent National Electoral Commission (CENI) with the financial support of the European Union and technical support of the United Nations, the election was peaceful and deemed relatively free and fair by the international community, despite some major irregularities. The international community and UN experts were unanimous in their finding that the irregularities did not have an impact on the final outcome. One major problem was the lack of experience and the politicization of the CENI. Composed of 17 members, 5 from parliamentary majority party (RPT), 5 parliamentary opposition (3 from the UFC and 2 from the CAR), 3 from the extra parliamentary opposition, 3 from civil society, and 1 representing the government, the CENI was supposed to be independent of political influence. Even though the CENI appeared to be balanced, in fact two of the members from the extra parliamentary opposition and two of the representatives of civil society were known to be allied with the RPT, thus giving the ruling party clear control over the CENI. As a result, the organization of the election was fraught with disagreement and delays. Another problem was the lack of cohesion between the opposition parties. Initially committed to choosing a single candidate, they were never able to agree on whom that should be. The UFC insisted on having Gilchrist Olympio as their candidate, since he had been prohibited from running in previous elections, while the CAR felt that it was their turn as they had backed the UFC candidate in 2005. As a result, there were seven candidates running for president in the election, incumbent President Faure Gnassingbe and six opposition candidates. In addition, Gilchrist Olympio (by far the best known and most popular of the opposition candidates) was unable to run since, due to an accident while traveling in the United States, he did not submit his application within the legal deadline. Jean-Pierre Fabre, UFC's Secretary General, replaced Gilchrist Olympio as the party's candidate. On March 6, the electoral commission released preliminary results announcing that President Faure Gnassingbe received roughly 60% of the vote. The nearest challenger, UFC candidate Jean-Pierre Fabre, only received about 33% of the vote. These results were confirmed by the Constitutional Court on March 18. However, even before the preliminary results were released, Jean Pierre Fabre proclaimed himself the winner and accused the RPT of stealing the election. Despite loud and frequent accusations of fraud, the opposition was unable to provide any evidence. Nonetheless, the opposition continued to express its disbelief of the results and organized numerous marches in the weeks following the election. Fortunately, these were predominately peaceful. In October 2010, Jean-Pierre Fabre resigned from the UFC and formed a new party, the National Alliance for Change (ANC). Now in his second term, President Faure Gnassingbe continues to face a significant challenge: balancing entrenched interests with the need to implement democratic reforms and revive Togo's deteriorating economy. Togo's long-suffering population has seen its living standards decline precipitously since the beginning of the 1990s. The Togolese judiciary is modeled on the French system. For administrative purposes, Togo is divided into 30 prefectures, each having an appointed prefect. Subsistence agriculture and commerce are the main economic activities in Togo; the majority of the population depends on subsistence agriculture. Food and cash crop production employs the majority of the labor force and contributes about 47% to the gross domestic product (GDP). Coffee and cocoa are traditionally the major cash crops for export. Cotton cultivation increased rapidly in the 1990s, with 173,000 metric tons produced in 1999. After a disastrous harvest in 2001 (113,000 metric tons), production rebounded to 168,000 metric tons in 2002. However, cotton exports have plummeted in recent years due to arrears in payments to farmers, low cotton prices, and poor weather conditions; many cotton farmers have switched to other crops. As of December 2007, the Togolese Government had paid back all arrears to cotton farmers, and the industry is recovering slowly. Despite insufficient rainfall in some areas, the Togolese Government has achieved its goal of self-sufficiency in food crops — corn, cassava, yams, sorghum, millet, and groundnut. Small and medium-sized farms produce most of the food crop; farms range in size from one to three hectares. Commerce is the most important economic activity in Togo after agriculture. 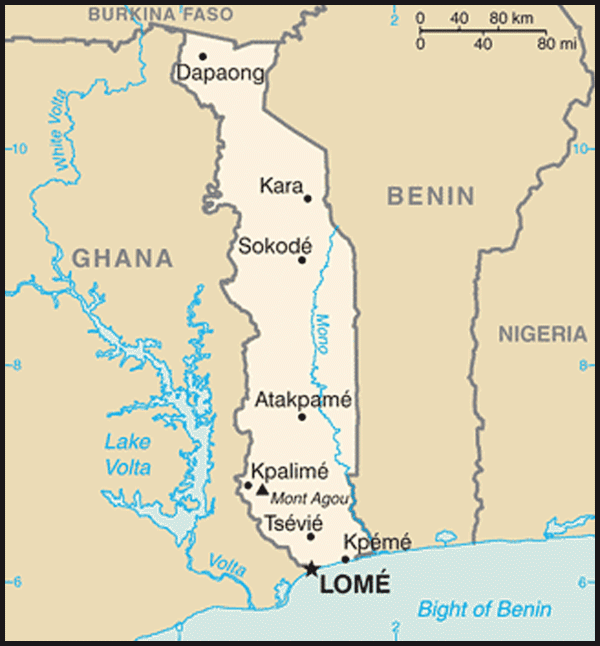 Lome is an important regional trading center. Its deep water port operates 24 hours a day, mainly transporting goods to the inland countries of Mali, Burkina Faso, and Niger. Lome's "Grand Marche" is known for its entrepreneurial market women, who have a stronghold on many areas of trade, notably in African cloth. In addition to textiles, Togo is an important center for re-export of alcohol, cigarettes, perfume, and used automobiles to neighboring countries. Political instability during the last decade has, however, eroded Togo's position as a trading center. In the industrial sector, phosphates are Togo's most important commodity. The country has an estimated 60 million metric tons of phosphate reserves. From a high point of 2.7 million tons in 1997, production dropped to approximately 800,000 tons in 2007. The fall in production is partly the result of the depletion of easily accessible deposits and the lack of funds for new investment. The formerly state-run company benefited from private management, which took over in 2001, but the phosphate industry has all but collapsed in recent years. The International Monetary Fund (IMF) recommended a financial and strategic audit of the sector and that the government seek a new investor to take over. In September 2007 the government obtained a loan from the Islamic Development Bank to inject into the sector. The company produced 1.5 million tons of phosphates in 2009. Togo also has substantial limestone and marble deposits; limestone is becoming an increasingly important export. When bilateral donors cut off assistance to Togo in the early 1990s as a result of the regime's poor democracy and human rights performance, the country was unable to service its debts to multilateral lenders, who ceased their programs as a result. 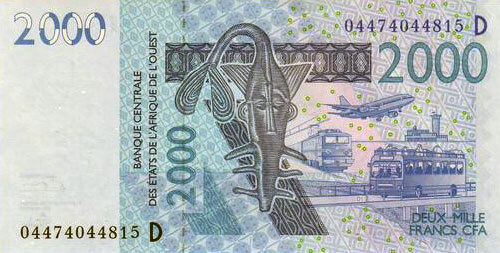 As part of the Government of Togo's strategy to address donor concerns, in 2006 it undertook discussions with the IMF toward the resumption of a country program. Togo successfully completed an IMF Staff-Monitored Program in mid-2007, and the IMF resumed aid through a Poverty Reduction and Growth Facility arrangement. After the successful legislative elections in October 2007, missions from the EU, IMF, and World Bank visited Togo to assess the financial state of the country. The EU, immediately after the elections, reinitiated assistance with a grant of 26 million Euros to be used for urban development and democracy projects. The World Bank forgave $135 million in arrears in February 2008 and re-engaged with Togo in May. The African Development Bank followed suit in July 2008 by forgiving $24 million in arrears. Togo developed an interim poverty reduction and growth strategy paper in April 2008, which, after another successful evaluation in October 2008, led to the decision that Togo qualified for Heavily Indebted Poor Country debt relief. The EU provided an additional $22 million for direct budget relief in 2009 and provided $12 million to finance the presidential election. Togo is one of 16 members of the Economic Community of West African States (ECOWAS). The ECOWAS development fund is based in Lome. Togo also is a member of the West African Economic and Monetary Union (UEMOA), which groups eight West African countries using the CFA franc; the eight countries are Benin, Burkina Faso, Cote d'Ivoire, Guinea-Bissau, Mali, Niger, Senegal, and Togo. The West African Development Bank (BOAD), which is associated with UEMOA, is based in Lome. ECOBANK, a pan-African private bank, also has its headquarters in Lome. Togo long served as a regional banking center, but that position has been eroded by the political instability and economic downturn of the early 1990s. Historically, France has been Togo's principal trading partner, although other European Union countries are important to Togo's economy. Although Togo's foreign policy is nonaligned, it has strong historical and cultural ties with western Europe, especially France and Germany, the former colonial powers. Togo recognizes the People's Republic of China, North Korea, and Cuba. It re-established relations with Israel in 1987. Togo is a pro-Western, market-oriented country. The United States and Togo have had generally good relations since its independence, although the United States has never been one of Togo's major trade partners. U.S. exports to Togo have generally been used clothing and scrap textiles. Other important U.S. exports include rice, wheat, shoes, and tobacco products, and U.S. personal computers and other office electronics are becoming more widely available. The Government of Togo, with the support of the Overseas Private Investment Corporation (OPIC) and the U.S. Agency for International Development (USAID), established an export processing zone (EPZ) in Togo in 1989. The zone has attracted private investors interested in manufacturing, assembling, and food processing, primarily for the export market. USAID closed its local office in 1994 and runs local development programs from its office in Accra through nongovernmental organizations in Togo. Contour Global, an American power company, built a new power plant in Lome that provides 100 megawatts of electricity. Plant operations began in October 2010. At a cost of over $200 million, it is the largest single private American investment in West Africa in over a decade and the largest electricity investment ever made in Togo. Peace Corps began its work in Togo in 1962, and since that time has hosted more than 2,200 Peace Corps Volunteers. Currently there are approximately 100 Volunteers serving in Togo. Volunteers have a successful history of collaboration and involvement with the Togolese people at all levels. Their efforts build upon counterpart relationships and emphasize low-cost solutions that make maximum use of local resources. Partnering with local and international organizations is an important component of Volunteer project activities. Volunteers work to promote self-sufficiency in the areas of small business development, education, environment, and health. All Volunteers, regardless of sector, are trained in how to promote HIV/AIDS awareness and prevention. The U.S. Embassy (http://togo.usembassy.gov/) is located on Boulevard Eyadema, Lome (tel: 228-261-5470/1/2/3). The mailing address is B.P. 852, Lome, Togo (international mail) and AmEmbassy Lome, 2300 Lome Place, Washington, DC 20521-2300 (by diplomatic pouch).